How Will Tampa’s Next Mayor Address Climate Change? Click here: to register now! Network Bazaar where faith and climate action groups explore and connect. World Cafe Conversations that deepen our relationships and understanding. Open Space Groups in which participants design collective actions. Spiritual engagement with grief, loss and hope for future compassion. Presenters will be interwoven into the conversations, discussion groups, bazaar explorations. Participants will bring their passion, urgency and concerns together and leave knowing our actions are needed now in both big and small ways. 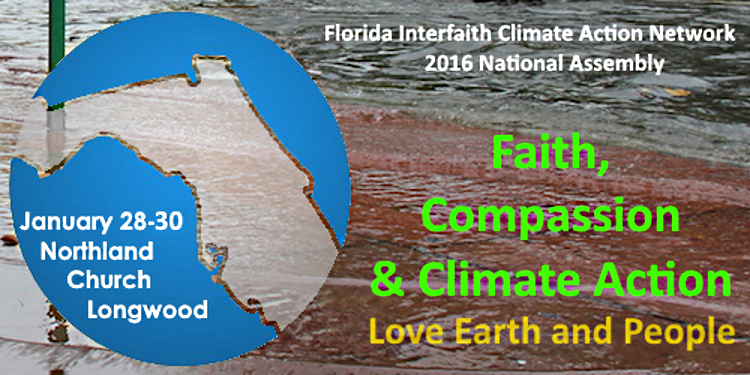 They will have new relationships, additional groundings, and definite actions to fuel their imagination, prayers and work on climate issues. Scientists tell us that rising seas will swamp huge areas of many great cities, from Shanghai to New York. Much of Florida will disappear … Millions of people will be thrown into extreme poverty by drought and the disappearance of soil and flooding. We are told that if the planet heats up by 3.9 degrees Fahrenheit (a path we are currently on), 600 million people will be displaced. Where will they go? Who will welcome them? How would they get there? If the planet heats up by 3.5 degrees, 280 million people will perish. Listen to Matthew Fox from the 2013 Gladdening Light conference.